Top 10 Hot Plants for an Autumn Border. ← Two days in Paris : why you should visit now. I love Autumn. I love how we can throw off the tasteful blue and white restraint of the summer garden and embrace those seemingly, in our northern light, garish, hot colours of yellow, orange and red. These colours glow in the lower levels of autumn light, appearing more subdued, more mellow. Sunsets, warming bonfires, russet trees all reflected in their glowing colours. 10 Hot Autumn Plants which will add a little warmth to your autumn garden. Most should be easily available. Give them a good start by preparing your soil well and deadhead regularly to keep the season going. 1. 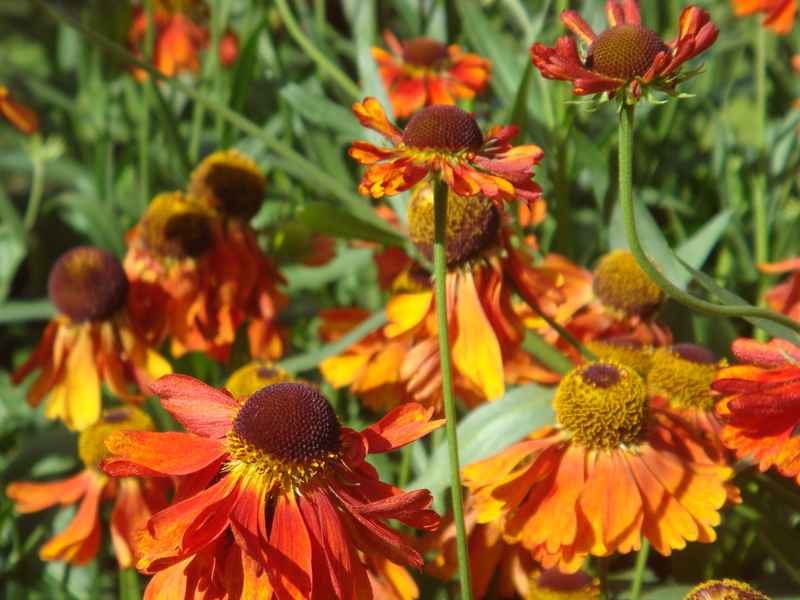 Heleniums (sneezeweed): Fabulous American natives which will add such a buzz to your border. Place them where they catch the rays of the afternoon sun. They need moisture retentive soil and full sun to thrive. Try H. ‘Moorheim Beauty’ or H ‘Sahin’s Early Flowerer’ (RHS AGM). 2. 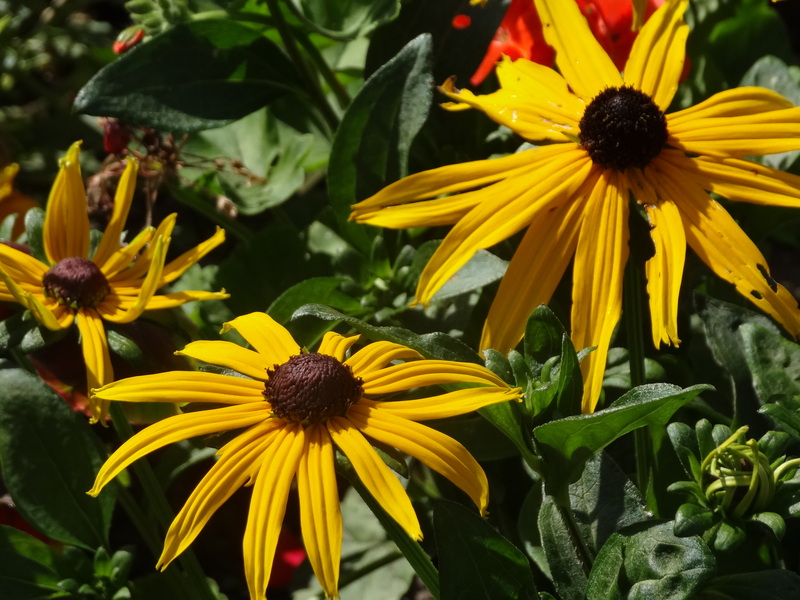 Rudbeckia fulgida (black-eyed susan/coneflower): A really bright cheerful yellow and another North American native. Likes the sun and good soil. The seed is much loved by finches in winter. 3. 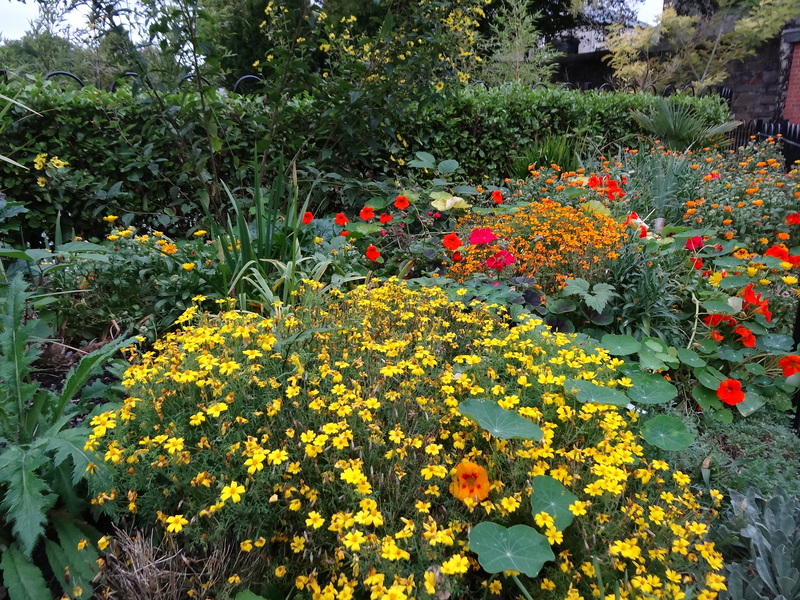 Calendula (pot marigold) : Aromatic leaves with vivid orange flowers borne all summer long and well into autumn, it grows well in light, poor soil. Medicinal uses and the florets can be added to salads. 4. 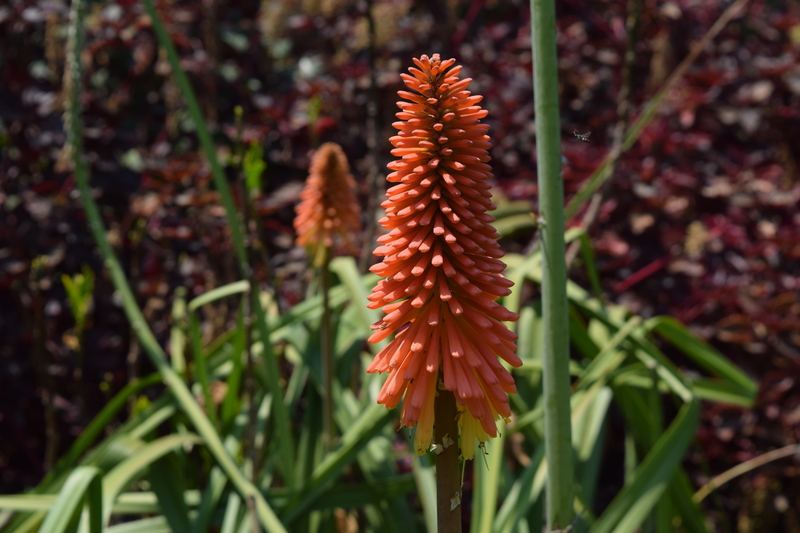 Kniphofia (red-hot pokers) : Originating in South Africa, go for the late flowering evergreen variety, Kniphofia rooperi, which adds lovely autumn colour. 5. 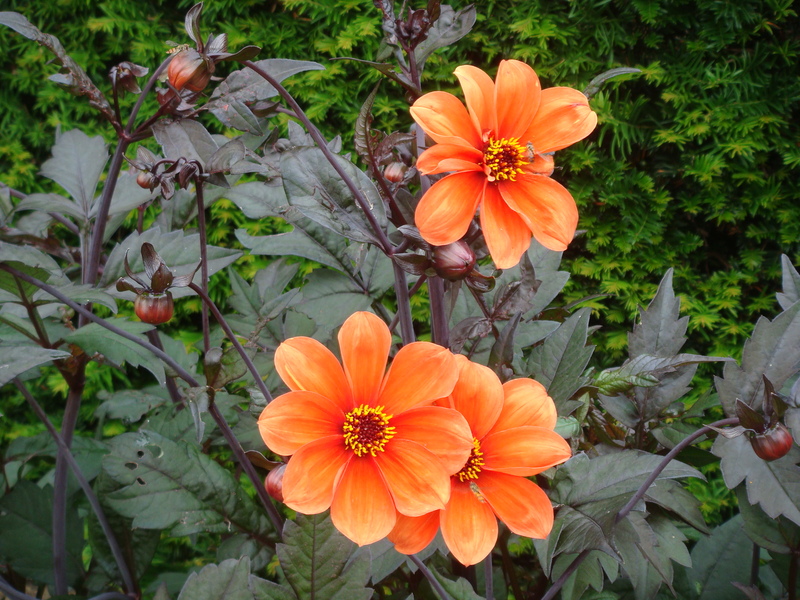 Dahlia : the national flower of Mexico, these tuberous perennials come in a vast array of cultivars. I like the single flowered varieties with bright flowers and dark foliage, such as D. ‘Bishop of Oxford’, coppery-orange, or D. ‘Bishop of Llandaff’, bright scarlet. 6. 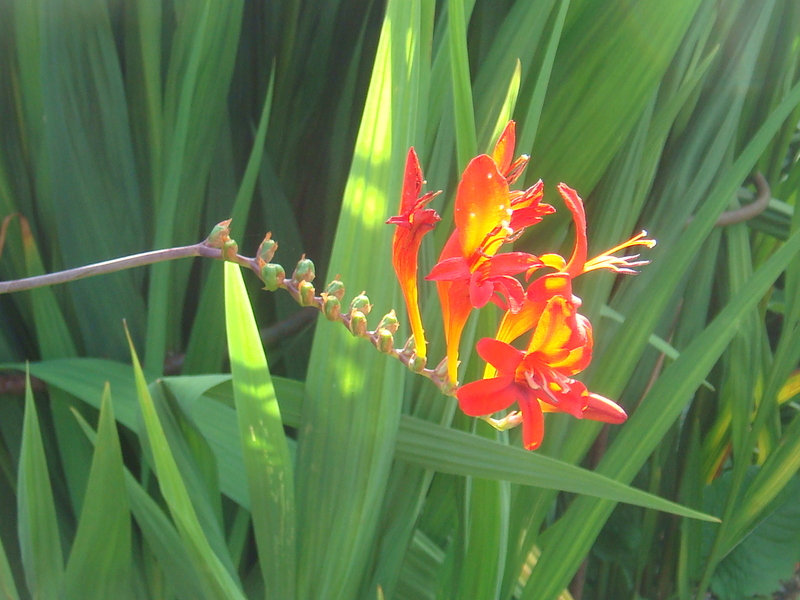 Crocosmia (montbretia) : One of my father’s favourites, probably because it reminded him of his native Ireland where it’s often seen spreading along the verges, Crocosmia is native to the grasslands of east Africa. Crocosmia ‘Lucifer’ and C. ‘ Emily McKenzie’ have lovely striking colours. 7. Echinacea (coneflower) : Showy drought tolerant plants, much loved by bees, usually purple but new varieties of this American native such as bright rose-red E. ‘Twilight’, and E. ‘Sundown’ are becoming more generally available. 8. 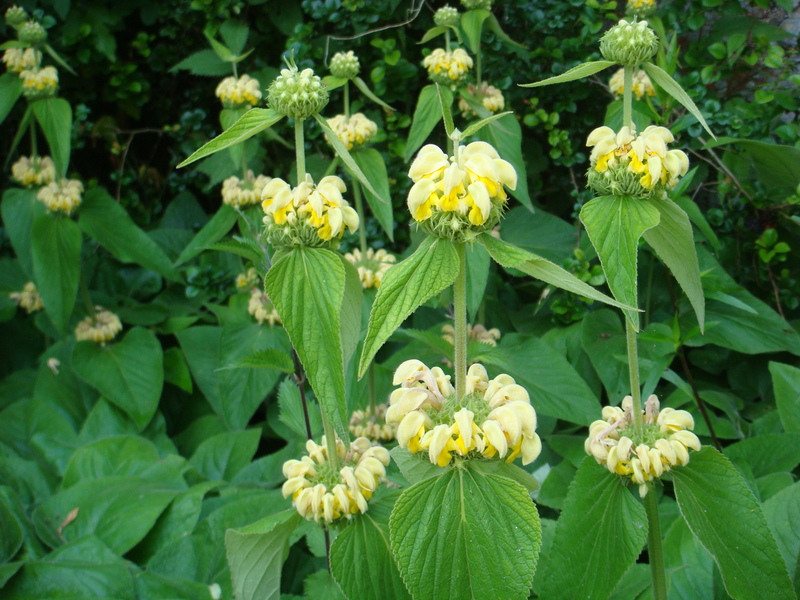 Phlomis russeliana (turkish sage) : Long flowering season and an interesting structural shape make this a great mixer. 9. 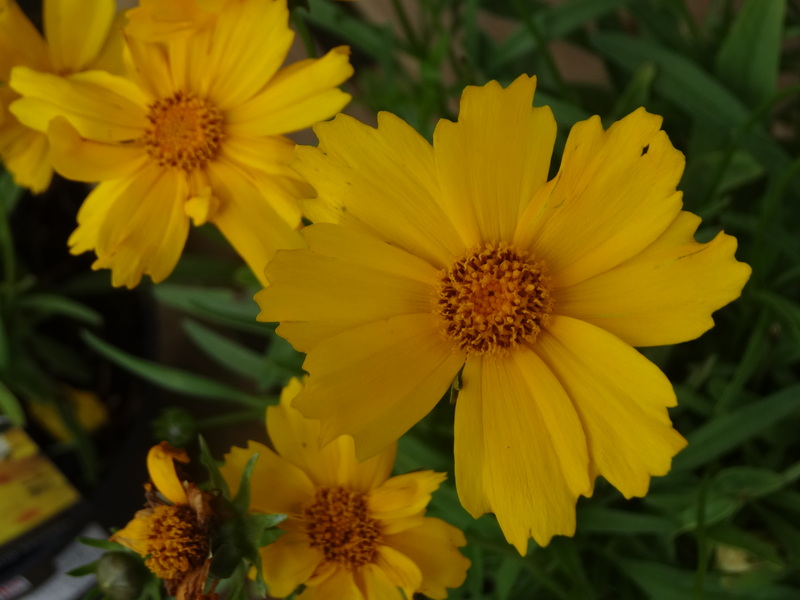 Coreopsis (tickseed) : A bright cheerful yellow, the daisy like flowers are attractive to butterflies. 10. Monarda (bee balm) : Widespread across North America, the crushed leaves have been used in traditional medicine. A long flowering season, interesting flower heads and very attractive to pollinators make this a favourite. 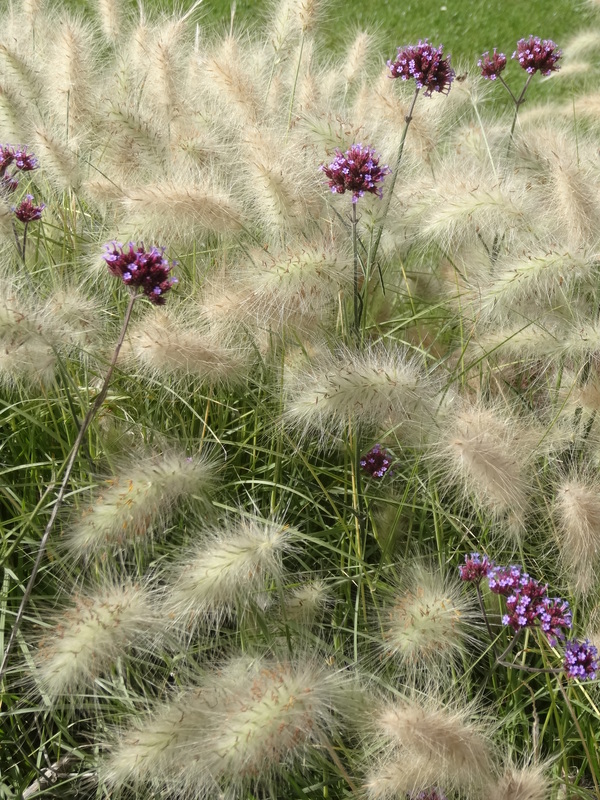 Any of the above will look wonderful mixed with grasses such as Pennisetum and Miscanthus and the purples of Verbena bonariensis, asters and Echinacea. 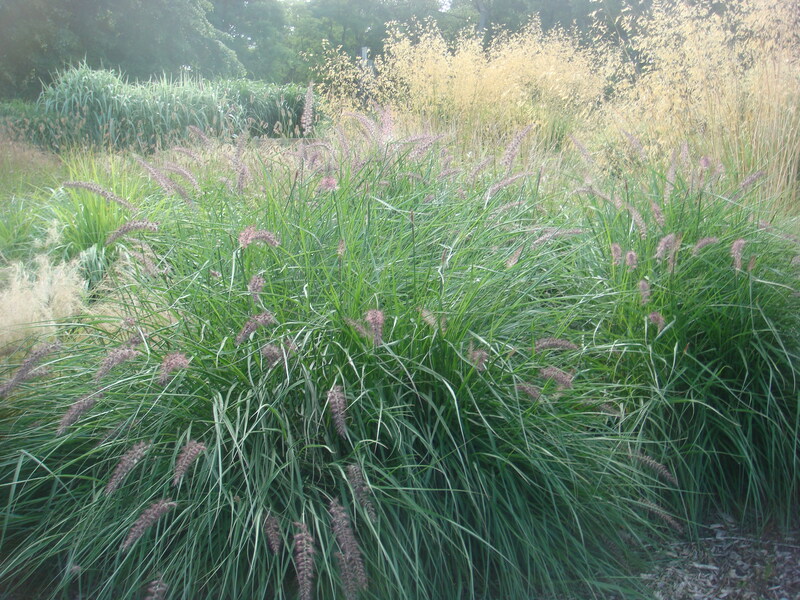 Grasses really come into their own, swaying in the low Autumn light, perfect companions to the bright flowering plants above. Autumn is a time of reflection too for gardeners, of planning for the seasons ahead, planting spring bulbs and regenerating borders. So ensure that you include some late flowering perennials – good for extending the season for pollinators as well as encouraging you to enjoy your garden well into the autumn. 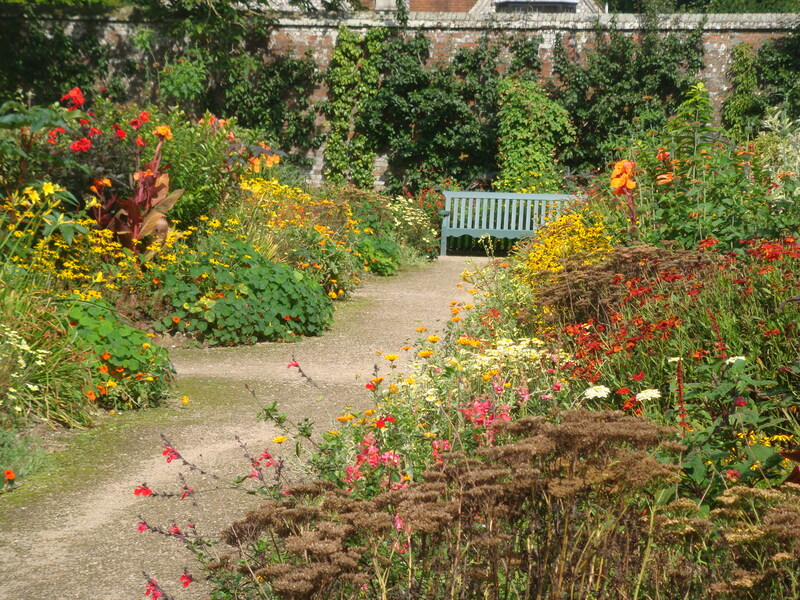 Autumn borders : Tall Cannas can be seen amongst Heleniums, Rudbeckia, Coreopsis and Nasturtiums. Many thanks Cynthia. Wrote this a little while ago when summer seemed to come to an end and we needed something cheerful to look at. Gorgeous colors. The Dahlia also has nice leaf color. Many thanks. Yes, the leaf colour is my favourite and looks so well against the autumnal shades.